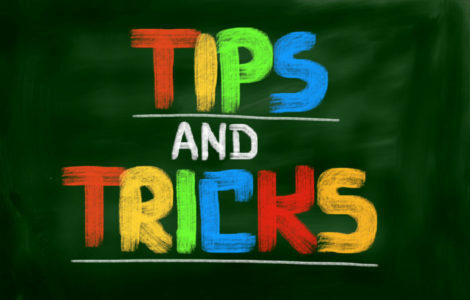 Keyword research is one of the first steps of any successful SEO campaign. One pitfall that a lot of people fall into, however, is focusing too much on the high competition keywords that are difficult to rank for. They get mesmerized by a high search volume, and fail to take into account just how hard it will be to get in front of those 57,000 searchers every month. And they don’t even consider if the keyword suggests any sort of profitable intent from the searcher. The solution to the keyword research woes is using long tail keywords for SEO. These low hanging fruit are easy to compete for and generally convert better than shorter keywords. In this post, we’ll show you exactly why. Long tail keywords are pretty much exactly what you would expect: keywords with more words in them. Generally, at least 3, but it gets a little more nuanced than that. You see, the term “long tail” is actually a reference to an analysis of the distribution of keyword searches. It turns out that the keywords that get the most searches per month have the smallest total share of searches. 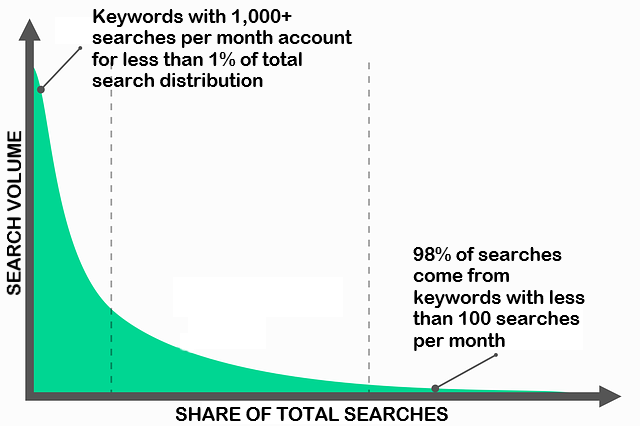 In fact, keywords with 1000 or more searches per month account for less than 1% of the total number of searches online. The long tail of the graph is that thin line composed of keywords with less than 100 searches per month. While these low volume phrases are generally not valued very highly by SEOs, they account for 98% of the total share of internet searches. To put that a little bit more simply, if there were only 100 people conducting searches on Google, 98 of them would be typing longtail, low volume keywords into the search bar. So, now you understand that long tail keywords are what most people are searching for on the internet. While individually, any long tail keyword doesn’t account for very much search traffic, collectively they add up big time within a given niche. 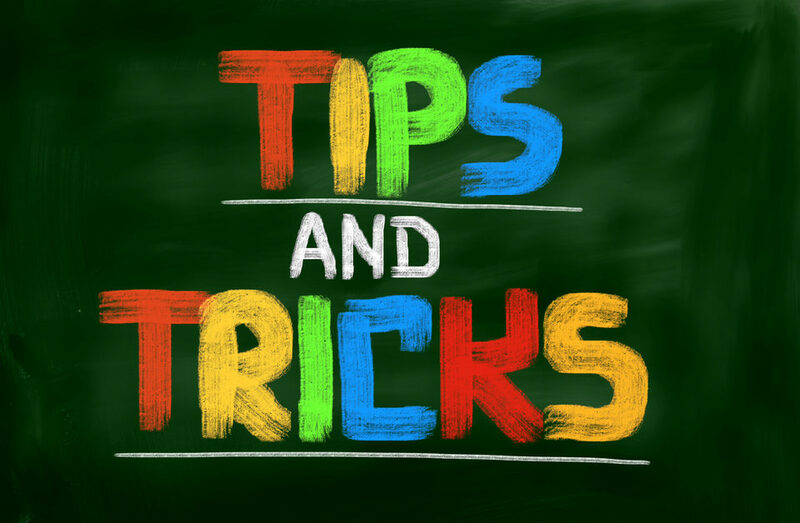 With that in mind, here are several of the benefits of using long tail keywords for SEO. The reason that long tail keywords have such a large share of the search is because they account for the way people actually search for things online. While millions of people might be interested in “auto repair” on any given day, most of them are searching for very specific things, like “how to fix a flat tire” or “how do I know if my car battery is dead”. When you target long tail keywords, you can have a very clear idea of what your user is hoping to get from the results and direct your content likewise. For example, this post you are reading right now is targeting the term “long tail keywords for SEO”, which allows us to focus much more narrowly than a post that was targeting “keyword research” or “SEO strategy”. Since long tail keywords predict a stronger intent from the user, that means they also convert better. In fact, web pages targeting long tail keywords convert at 26% on average, compared to just 10% for pages based around more general search terms. Someone searching for “shoes” or even “men’s shoes” doesn’t have the same level of commercial intent as someone who googles “business casual men’s sneakers”. So targeting long tail keywords doesn’t just mean that you’ll have an easier time ranking. It also means there will be more value to the traffic you do bring in. While those big volume head keywords might not convert as well, traffic is traffic. Eventually, they should be a long term goal within your SEO strategy. And long tail keywords are perfect for helping you move the needle on more competitive terms. Google isn’t going to rank you for “personal finance” unless it thinks you’re an authority in the niche. The more you are bringing in traffic for terms like “budgeting tips for college students”, “how to save for a family vacation”, and “best apps for financial planning”—the more Google is going to recognize your site as an authoritative source. In the end, long tail keywords are the linchpin to a successful content marketing strategy. By focusing your keyword research around low competition search terms with crystal clear user intent, you are going to rank more easily and drive more targeted traffic. Your long tail keywords should drive your blog content. Behind every long tail keyword is a user looking for a specific type of information. The more you can create quality content that gives users what they need, the better chance you’ll have of ranking. In other words, long tail keywords reveal user intent, and therefore form a solid base for the type of content you need to create. One thing to keep in mind is that just because a keyword has low search volume doesn’t necessarily mean it’s not competitive. Take the term “how to lose weight during pregnancy if obese”. This only gets 10 searches per month and seems like an incredibly narrow keyword. It should be easy to rank for, right? Not when the first page of the SERPs includes sites like Healthline, ScienceDaily, and the Chicago Tribune—all with a domain authority in the 90s. In this case, it’s because our keyword is really just synonymous with a more general search term. The same pages that rank for this one also rank for more competitive terms like “obese and pregnant” and “obese pregnancy”. So, as you go forward and start using your newfound knowledge of long tail keywords for SEO, just remember that not all long tails are created equally. You've got to evaluate the competition just like any other type of keyword research.